Removing a tree that is in a troublesome area is not a task for amateurs. 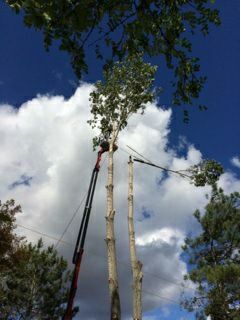 That is why the pros at Turgeon Tree Removal have provided Sudbury with quality and safe tree removal using state-of-the-art equipment. Not only can they remove a tree, they can turn it into valuable mulch for your home landscaping with their chippers. If you have any questions or would like to get a quote on a job do not hesitate to call.